As part of the AK Lawn Care assessment and custom quote, we survey the outdoor areas of your property to ensure they are graded properly. In some cases, the land has slopes that may need to be excavated to ensure proper installation of the project. While the excavation and leveling helps make space for the new installations, it also leaves a certain portion of the slope exposed. Over time, this can result in mudslide and soil erosion. To avoid future issues, AK Lawn Care can install retaining walls that not only serve an important purpose, but are aesthetically pleasing. 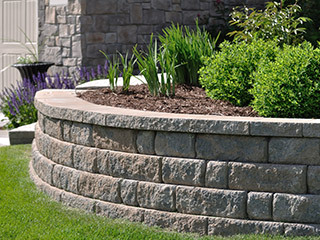 Just like pavers, the options are endless when it comes to designing and installing a retaining wall. We typically use CMUs in the construction of these walls. These concrete masonry units are modular in structure and can be used to build walls of any height and length. Not thrilled on how concrete retaining walls look? We can also use materials such as brick, stone, and wood in numerous colors! Additional options for multi-functional retaining walls can include built-in seating or recessed lighting. This adds to the beauty and functionality of the feature, and compliments any area around an outdoor fireplace, pool, kitchen, or patio! AK Lawn Care always uses the best materials on the market, and will deploy skilled and experienced masons for the job. Proper installation ensures the retaining wall will be durable for a long period, with minimum maintenance. We are happy to take your project from start to finish! 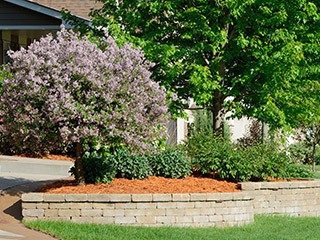 Call us at 734-439-3063 and speak with our experts about your landscape dreams.